First of all, a big thank you to Yorkshire Game Angling for sending us down a few packs of their excellent fly selections to try out. We always love receiving gifts that we can test out and review on the site. Yorkshire Game Angling sent us a pack of Diawl Bachs, Damsels and Cats Whiskers to try out and that’s what I did yesterday on my local water. It was a similar day to the last few sessions on the water with fish rising and taking food from just below the surface. The first time I saw this a few weeks ago I had a great few hours. The second time I had a not so good day so this time I was determined to crack it and get some of these feeding fish in the net. I started off on the west side of the lake with the wind behind me but no fish were showing and I had no action for the first hour. I decided to walk round the windward side and fish were moving everywhere on the surface. I changed my set up to an emerger on the point, a Yorkshire Game Angling Diawl Bach on the middle dropper and a black buzzer on the top dropper. I was expecting to get into a fish pretty quickly but again the fish seemed to only want one type of food. After a few fly changes on the point to try and work out what they were feeding on in the surface I finally hooked into a great 4lb rainbow on the Yorkshire Game Angling Diawl Bach. 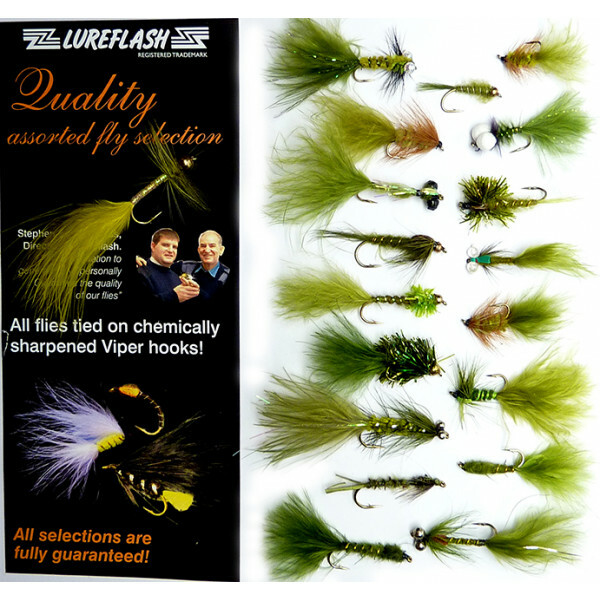 In the selection pack were some standard Diawl Bach flies but also some really interesting variations on curved hooks and also using sparkly tails. The red Diawl Bach in the photo above was the catching fly. I’m not normally a Diawl Bach fan but these flies may just have changed my mind! The cats whiskers didn’t get a try out this time but I did have a go with a Damsel towards the end of of my session and managed to catch another lovely rainbow. The damsel top left in the photo was one of my favourites – small, mobile tail, good light colour with a nice red hot spot at the front. It certainly did the trick. 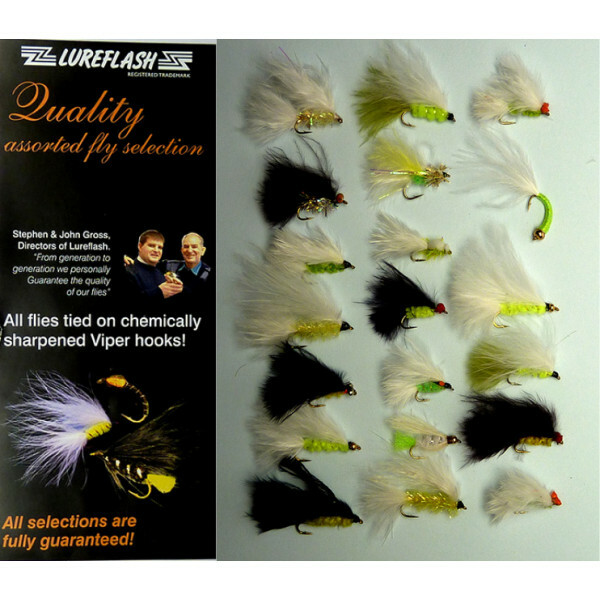 If you need a good selection of widely used flies and you don’t tie yourself then these selection packs are perfect. 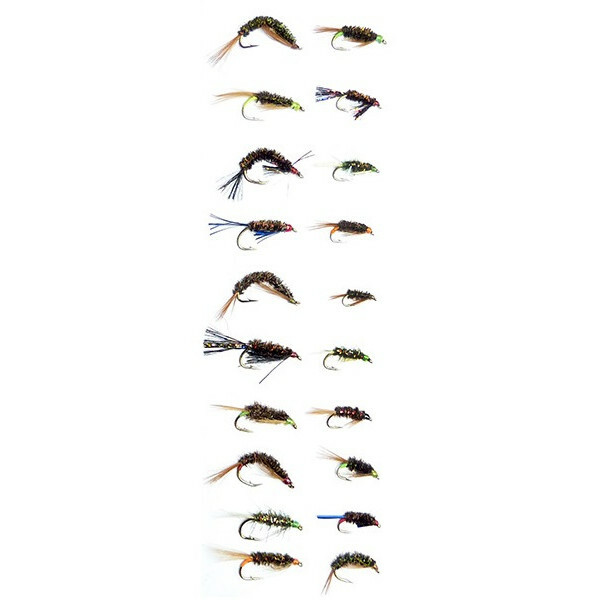 You get all the standard patterns plus some other exciting variations to try. Highly recommended.